Biotherm has launched Eau Soleil, the latest in their series of perfumed body sprays. Eau Soleil is safe to wear in the sun, and features notes of lemon, orange, fig, blackcurrant, tiare, musk and sandalwood. 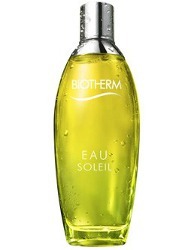 Biotherm Eau Soleil is available in 100 ml Eau de Toilette. This sounds appealing to me for a light summer scent. I haven’t tried any of their other body sprays – any opinions out there? If I’ve ever smelled one, I’ve forgotten it. Agree this one sounds nice. Most of them are nice enough but not great. Let’s say I’ve never been moved to buy one. I love one of their bodylotions though which smells of citrus. If the lotion was their classic Lait Corporal (which is “citrus infused”) then you might be interested to know they now have a “perfumed spray” of that scent. That is the one. I’ve got the classic Lait corporel with agrumes, and the body milk from the Eau Vitaminée line. I love to layer the latter with Cristalle or Eau du Sud.